A range of modern robust metal lecterns made in aluminium in different styles and finishes. For most models, the standard stock finish is natural (extruded) aluminium, and silver, black or white powder coated paint finishes, but powder coating to any RAL paint reference is available, 'made to order'. Specialised hammertone and metallic colours can also be supplied. Unique DAXS versions combine Trilite aluminium truss, quad or ladder sections with large detachable acrylic tops. Beware cheap imitations - if it doesn't say DAXS or Trilite - then it probably isn't! 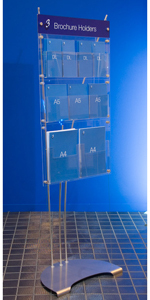 Lecterns can be easily branded by attaching a 'snap open' aluminium poster frame to the front tubes. Welding aluminium is a very skilled job, and all our lecterns and plinths are hand welded to the highest standard. However they are 'semi-industrial' products with visible welds (less noticeable on coated versions), and minor scratches and imperfections in the aluminium material and finishing is to be expected. Welding oxidisation and heat marks are unavoidable - choose a painted finish if you don't want to see them. Sleek and sylish premium aluminium lectern with a large detachable 12mm clear acrylic 70cm x 43cm top and welded lippped shelf as standard. The height of the reading surface from the base, slopes up from approx 105cm to 120cm at the front, and weighs 12Kg. Click image for larger view of front, rear, and with bespoke logo panel. Stocked powder coated in silver paint as shown, but available to order in any standard RAL colour as required. The lecterrn can be easily branded by adding an A4 or A3 logo frame, or a bespoke acrylic or foamex panel (phone for price) to the front tubes. This lectern is made of Trilite 200 aluminium trussing with 50mm (2") tubes, available in natural / extruded aluminium, or powder coated in silver, black or white paint. It's welded in 'one-piece', weighs about 8Kg and is easily carried. A 'clamp-on' support arm (e.g. for a laptop), or a drinks tray can be added (see Lectern Accessories). Click on image for dimensions. 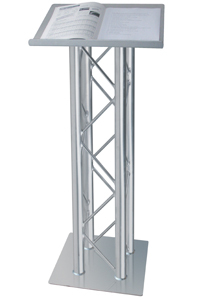 For AV Upgrade versions, see the Trilite Truss Premier Lectern below. Click for large view of lectern - in natural finish. One-piece aluminium lectern with twin truss sections and large 100cm wide top, and optional welded shelf. For AV Upgrade versions, the 'front-lipped' Premier style top is supplied - see AV Options below. This lectern is made of Trilite 200 natural aluminium with four 50mm tubes. The 'clamp-on' support arm (e.g. for a laptop), or a drinks tray can be added (see Lectern Accessories). Many of our lecterns with metal bases, particularly the larger and heavier models, can be 'made to order' with fitted castors as required. Adds about 70mm to height of lectern. 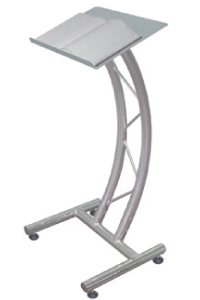 Castors are also available as a standard option for the DAXS Curved Lectern below. 'Premier' version of the standard truss lectern - in natural / extruded aluminium, or powder coated in silver, black or white paint. Has a larger top plate (60cm x 35cm) with extended front lip for branding, and one front tube pre-drilled for cable management. See below for AV Options. 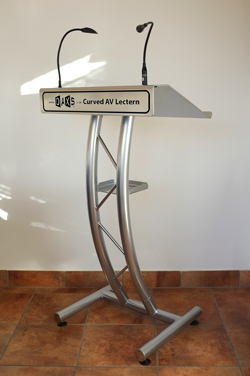 Most of our aluminium lecterns can be customised to include the 'front lipped' Premier style top, fitted with one or two 3-pin XLR industry standard microphone shock-mounts (we don't supply mics), with or without a BNC socket for a 5w light (lamp and 12v PSU supplied) - and trailing cables with in-line connectors. 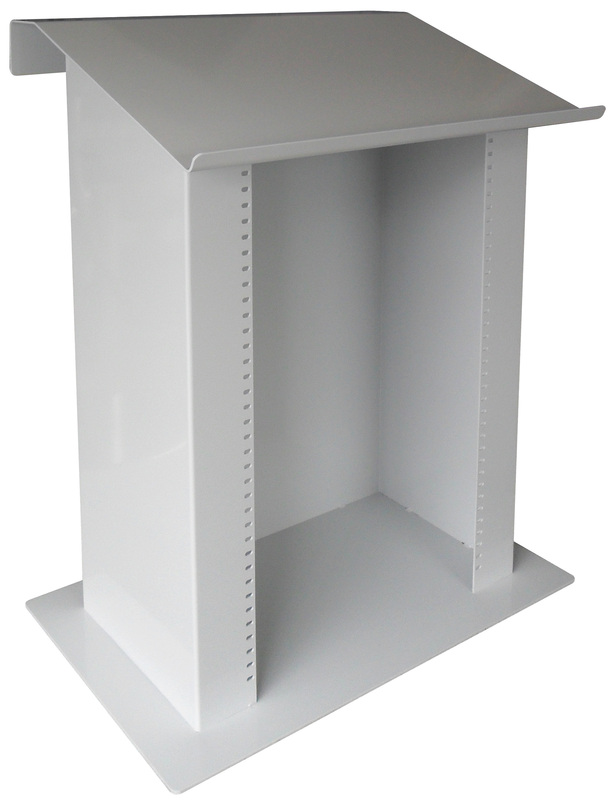 'Cabinet' style lectern in powder coated aluminium with 60cm wide Premier top and 3 removable / adjustable shelves - ideal for housing laptop / PC, literature, and various AV equipment. Can be customised with e.g. mic mounts (see AV Options below), castors etc - please phone to discuss your requirements. Optional printed logo panels (artwork required) for front and top lip can be supplied. A larger (75 cm wide top) 'Rack' version is also available to take industry standard 19" racks (up to 30u) for sound equipment. 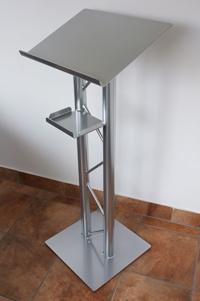 Excellent value, lightweight (6kg) yet robust lectern made from Trilite aluminium and powder coated in silver (stock colour) or black paint, with 46cm (w) x 35cm (h) top, and now includes a welded lippped drinks tray as standard. Click image for large view. 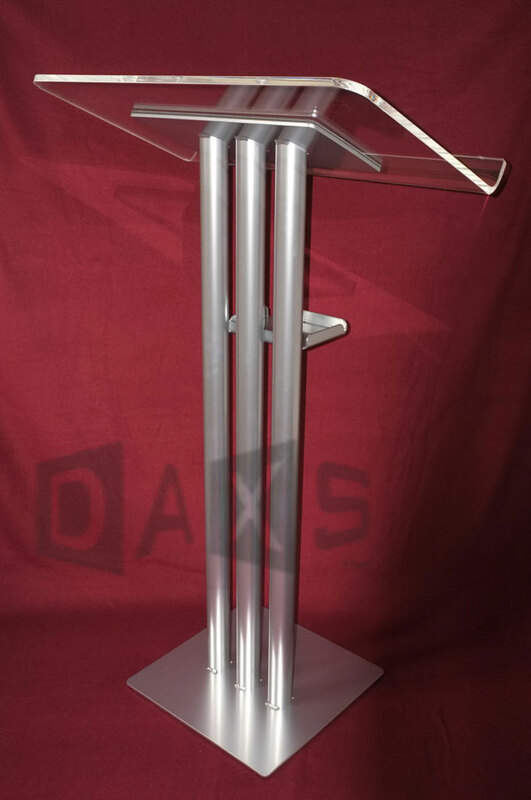 Unique collapsible and adjustable version of the DAXS Ladder Lectern, in smart powder coated silver paint finish, designed to be easily assembled and dismantled for transport and storage without using any tools. Ideal robust and reliable portable lectern for the travelling speaker or where storage space is limited. It has a 46cm w x 35cm h top, and provides continuous height adjustment from 85cm to 115cm (floor to reading lip), to suit some seated / wheelchair users (check measurements) or the tallest of speakers. Click image to see the optional carry bag - made from strong 600 denier foam backed and lined fabric, with carry handles, and includes protective blanket - approx 100cm x 45cm x 15cm, and 8Kg including the lectern. No messing about with spanners or nuts & bolts - simply slot the 3 sections together and tighten-up using the hand-wheels. 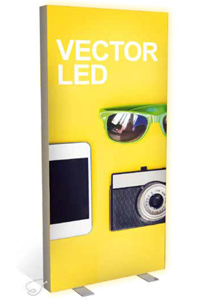 Adjust for height and attach a logo frame and /or shelf if required, and away you go! Click here to see the acrylic shelf / drinks tray. Take the DAXS Curved Lectern for a spin! This popular lectern is available with an optional curved acrylic front - ideal for branding with your logo / message as required. Click the image for a 360 degree view of the lectern - shown here in silver powder coated finish, with a brushed aluminium-effect acrylic front. The 'perforated' design is customisable. Made from Trilite aluminium with a large detachable 12mm clear acrylic 70cm x 43cm top (or optional welded / fixed 60cm wide aluminium top) small lipped welded drinks shelf, and adjustable articulated feet (or braked castors). Overall height is approx 120cm. Click image for larger view of front, rear, and the optional plain frosted acrylic panel. The standard stocked finish is powder coated silver, but it is also available 'made to order' powder coated in any RAL paint colour. Add a curved acrylic front (easily removed / changed with specially designed DAXS Clips), plain / unbranded, or including your printed message / logo (artwork required). Or, a simple A3 logo frame can be attached to the front tubes. 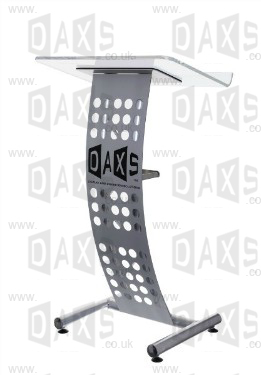 DAXS Curved Lectern with 60cm wide 'Premier' style metal top - fitted with one or two shock-mounts for 3-pin XLR mics (not supplied) and / or a BNC light socket (complete with lamp and PSU), drinks shelf, plus optional castors and acrylic front panel. 'Made to order', it can be powder coated as required in any standard RAL paint colour, e.g. shown in silver paint with AV2 Option. Curvacious lectern made of Trilite 200 aluminium ladder section powder coated in silver, black or white finish. 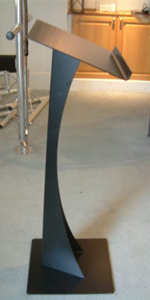 Stylish one-piece aluminium plate lectern in black, white or silver powder coated finish.